WORK OUT ON THE GO Our pair of gliding discs is compact and lightweight! You can easily fit them in a suitcase or carry-on, so you can work out right in your hotel room!!! What you will receive are 2 specially designed sliding pads. These are around 8 inches across, and double sided. One side is super-smooth, and allows the pads to slide on carpet. The other side is a little rougher, which hits the right balance on wood or laminated surfaces. One of the big benefits of these sliders (as opposed to other fitness equipment which focuses on the abs) is that you can easily take them with you when you travel. There are plenty of videos on Youtube showing you how these can be used. 20 or so exercise variations will help strengthen your core and abs. Many of these involve putting a hand on each pad, and then using the resistance to tighten your core. You will also find exercises which use the legs and more exotic variations which involve a sideways twist. Remember to take things easy, especially if you have not focused on your abs in other ways recently. There is no need for assembly – the pads are ready to go right out of the box. Occasionally you might want to polish them with a silicone spray or similar. Feedback from previous buyers is very positive, in terms of the overall star rating given and the general enthusiasm level in the comments. It can be hard to please people when it comes to abs and core (check some reviews for sit up benches or crunch trainers and you will see what I mean). This makes the 4.5 star average at the time of writing even more impressive. One thing which came through strongly in several comments was that the sliders were recommended by a friend or personal trainer. Speedy delivery (next day is available) and easy of use came in for some praise. Looking at the lower star feedback there were two types. Firstly, people saying they were not suitable for certain size and weight. Secondly people complaining about the lack of slide on their carpet. Others are happy on carpet, so I am guessing that shag-pile owners were left disappointed here! 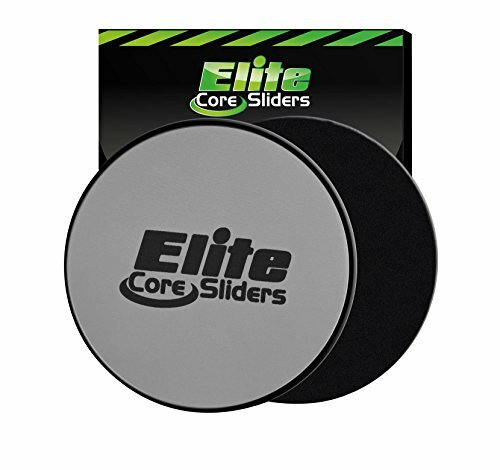 Elite Fitness Core Slide Exercisers are compact, and very effective. Using body resistance, you’ll get a thorough workout, and you’ll have no excuses to leave it at home while you travel! These pads are excellent value, and judging by the positive feedback will make a great addition to your home gym. Check out the picture gallery and user feedback for yourself on this dedicated amazon.co.uk product page.